Khaled Hafez and Sadik AlFraji are participating in TRIO—the first iteration of the Rio Biennial held from 5 September to 2 November 2015. With the overarching theme being Who said tomorrow doesn’t exist?, the event showcases contemporary art around the three-dimensional in its classic terms (such as sculptures and installations), as well as in its expanded fields (such as painting, drawing and photography). Both Hafez and Alfraji are part of a section called Utopia - Preterites of Contemporarity, which demonstrates how multidimensional works of art weigh a political and social focus. Following a highly acclaimed solo exhibition curated by Nat Muller and shown at Ayyam Gallery’s Al Quoz outpost in conjunction with 2014 Art Dubai week, Alfraji will be featured with his large scale stop motion video animation Ali’s Boat, a highly melancholic work that materialises the artist’s memories of a Bagdad that no longer exists. 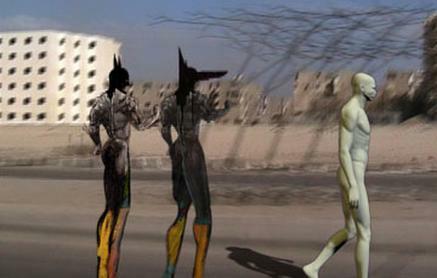 Hafez will appear with a video installation that belongs to his A77a Project and sees Set, the god of the desert, storms, and chaos, come to life and walk in the modern world while mocking the atrocities of Egypt’s current situation. The video is complemented by a life size bust of the deity rising from a pile of sand.